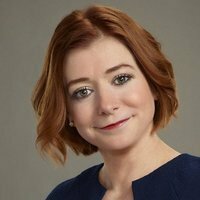 Alyson Lee Hannigan (born March 24, 1974) is an American actress. 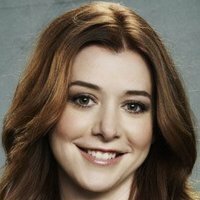 She is best known for her roles as Willow Rosenberg in the television series Buffy the Vampire Slayer (1997–2003), Lily Aldrin on the CBS sitcom How I Met Your Mother (2005–2014) and Michelle Flaherty in the American Pie film series (1999–present). Born in Washington, D.C., the only child of Emilie (Posner) Haas, a real estate agent, and Al Hannigan, a truck driver. Her father is of Irish descent and her mother is Jewish. Her parents divorced when she was two and she was raised mostly by her mother in Atlanta, Georgia. Hannigan began her acting career in Atlanta at the young age of 4 in commercials sponsoring such companies as McDonald's, Six Flags, and Oreos. She is a seasoned television actress veteran, guest starring in Picket Fences (1992), Roseanne (1988), Touched by an Angel (1994) and the The Torkelsons (1991) before starring in her most notorious role yet in Buffy the Vampire Slayer (1997) as Willow Rosenberg. Now she stars in the brand new comedy How I Met Your Mother, a hit-show, from CBS. Hannigan married fellow Buffy the Vampire Slayer actor 'Alexis Denisof' at Two Bunch Palms Resort in Desert Hot Springs, California, (October 11, 2003). The couple have two daughters, Satyana Marie Denisof (b. March 24, 2009) and Keeva Jane Denisof (b. May 23, 2012). Hannigan and her husband are godparents to Joss Whedon's son, Arden. Has a tattoo of tribal dolphins on her ankle, a Japanese kanji (for luck and happiness) on her back, and a cartoon turtle on her left foot. Was a clarinet player in junior high school. Played soccer until she got an injury in her early teens. Portrays the girlfriend of 'Seth Green' (qv)'s character in two different occasions. First was in the movie _My Stepmother Is an Alien (1988)_ (qv) and then later in _"Buffy the Vampire Slayer" (1997)_ (qv). 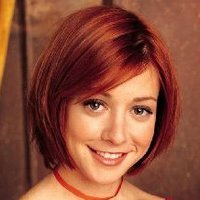 Her character on _"Buffy the Vampire Slayer" (1997)_ (qv), Willow Rosenberg, once mentions that she wrote _"Doogie Howser, M.D." (1989)_ (qv) fan-fiction as a girl. Hannigan went on to star in _"How I Met Your Mother" (2005)_ (qv) with 'Neil Patrick Harris' (qv), who as a boy played Doogie Howser. 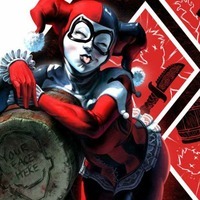 She was invited to join the cast of the TV show _In the Game (2005) (TV)_ (qv), but begged off, citing creative differences. Hannigan was supposed to play the best friend of the character played by 'Jennifer Love Hewitt' (qv), but according to a Knight Ridder/Tribune News Service interview reported January 25, 2005, she was unhappy with the diminished, trivialized role they presented her with. She chose to walk away from the offer. Irish-American on her father's side and Jewish-American on her mother's side, Hannigan was raised in the Jewish faith. The producers of _American Pie (1999)_ (qv) originally wanted her to play the role of Heather, but she wanted to play the role of Michelle because she thought it was funnier.